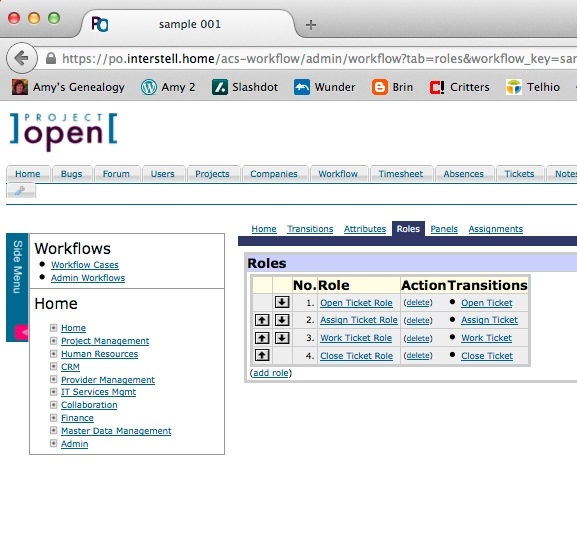 Project Open Advanced Workflow Part 2: Roles and Responsibilities – Interstell, Inc. This section will cover Roles and Responsibilities. My Project Open installation runs on CentOS 6.5 Linux. The examples should run on any modern of Project Open, though. I used the browser Mozilla Firefox under OS X 10.9.3 to capture the screen shots. You’ll see a screen like the one in Figure 1. Figure 1: You can see what Roles you’ve defined here. The Task name is under the Transitions column. What IDs or existing groups in Project Open will be added to each Role? What IDs or groups will control the assignments for the workflow — or will all of the steps simply be assigned statically (that is to say, will all of the steps simply obey whatever Roles/IDs/groups are assigned to them, or will they be dynamic or settable at run time)? At what workflow step will we set the other groups (if step #2 is not static)? I know that’s not as clear as I’d like, so let’s walk through two examples. The first will use all static assignments and the second will use dynamic assignments. Bill and Sally could pick up the tickets in the Assign Ticket workflow step (Task), but they could only “approve” the item to flow into the next step; they really couldn’t assign the ticket to anyone specific. I’ll present how to do the second example; the first example is a lot like the second, but without the Assignment step. We’ll begin work with the Sample 001 workflow we started in Part 1. Your screen should look like the one in Figure 2. 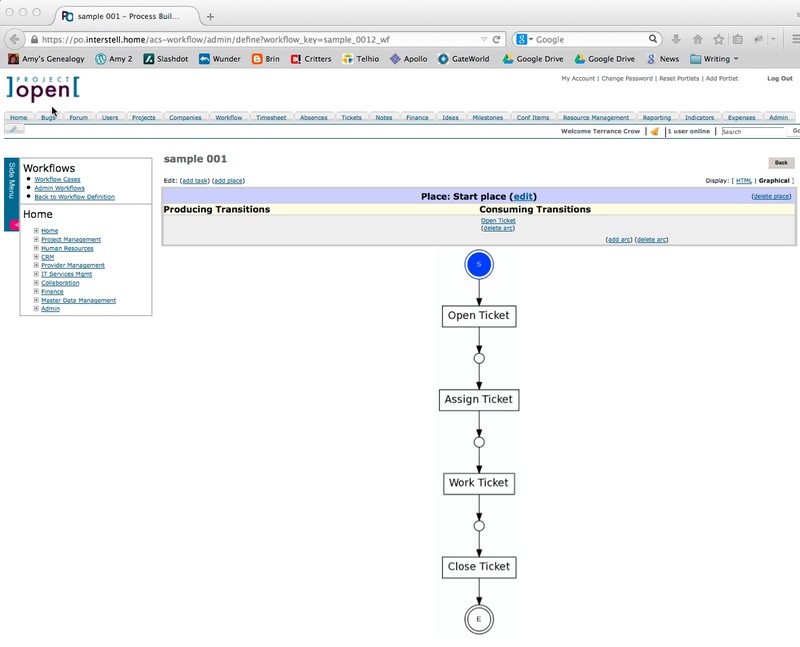 Figure 2: This is the text-based workflow exit screen. Just above the name of the workflow (“Sample 001” above), you’ll see several tabs, like Home, Transitions, Attributes, etc. 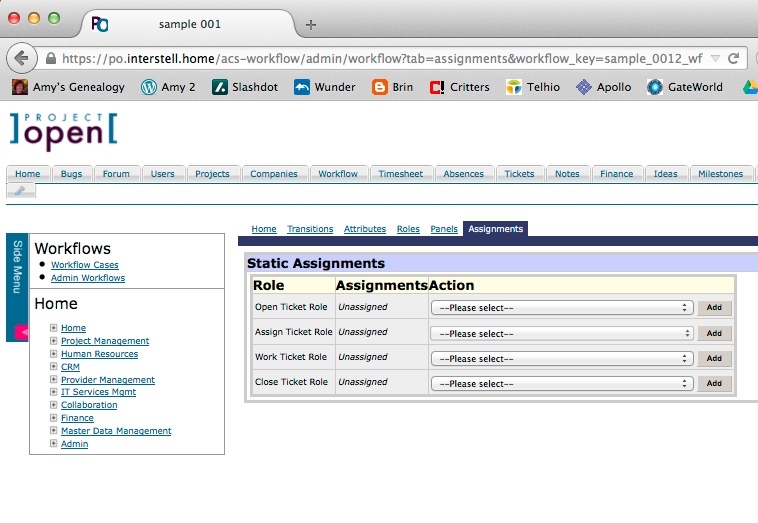 Find and click on Assignments to see a screen like the one in Figure 3. 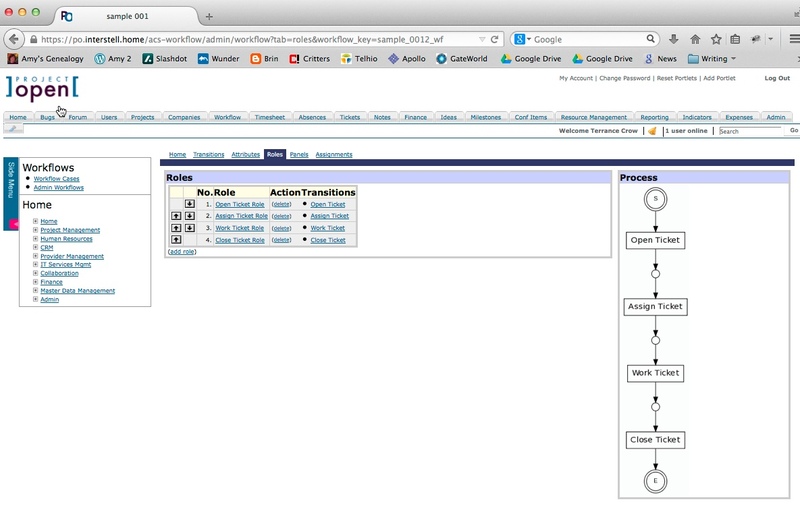 Figure 3: This is the screen that lets you assign individuals or groups to Roles. There’s a combo-box beside each Role (see Figure 3). 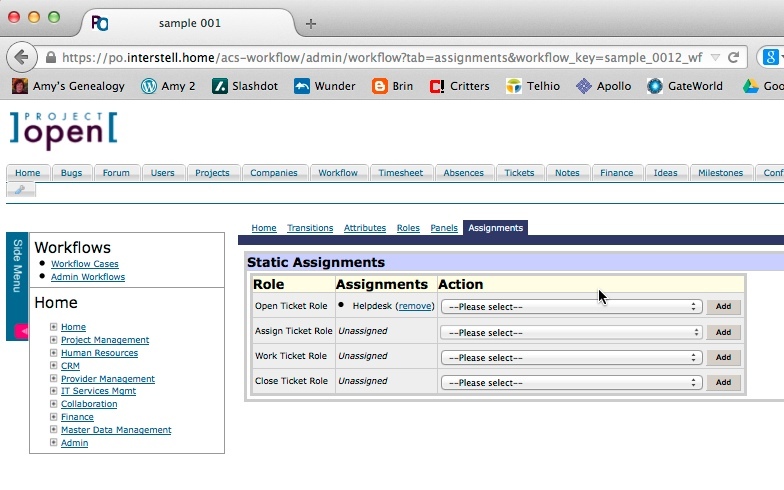 We can get started by opening the combo-box beside “Open Ticket Role.” You should see Helpdesk near the top. Click on it to see a screen like the one in Figure 4. Figure 4: The Helpdesk group is nearly assigned to the Open Ticket Role. We’re not quite done yet. We still need to click the Add button. Once you do, the screen should look like the one in Figure 5. Figure 5: The Helpdesk group is now firmly assigned to the Open Ticket Role. ou can assign a combination of IDs or groups to a role. For example, you could assign the Helpdesk group and two IDs to the Open Ticket Role; you could assign two or more groups. It’s up to you! In a similar way, we can assign my ID to the Assign Ticket Role. Open the combo-box beside Assign Ticket Role. Find my ID (or yours — I really shouldn’t be in your system). Click on the Add button. The screen should look like Figure 6. Figure 6: Now tcrow@interstell.home is assigned to the Assign Ticket Role. To finish this step, add the Helpdesk group to the Work Ticket Role and my (or your) ID to the Close Ticket Role. When you’re done, the screen should look like Figure 7. Figure 7: The Roles have been established! If wanted a static workflow, we could stop now. But we’re much more ambitious than that! We want to give the all-powerful tcrow@interstell.home ID the ability to choose just who will work the ticket. We do that through the graphical editor. To get to it, click on the “tab” Home. You should be back on the screen from Figure 2. Now, click on the URL “graphic process editor.” You should see a screen like Figure 8. Figure 8: This is what our Sample 001 workflow looks like in the graphical editor. Recall that we want the Assign Ticket Role member at the Assign Ticket workflow step (Task) to be able to select who in the Helpdesk group to assign the ticket to. We can do that by doing this. Click on the Assign Ticket Task. Click on the assignment URL (it’s near the top, under “add task” and above “Input Places”). You should see a screen like the one in Figure 9. 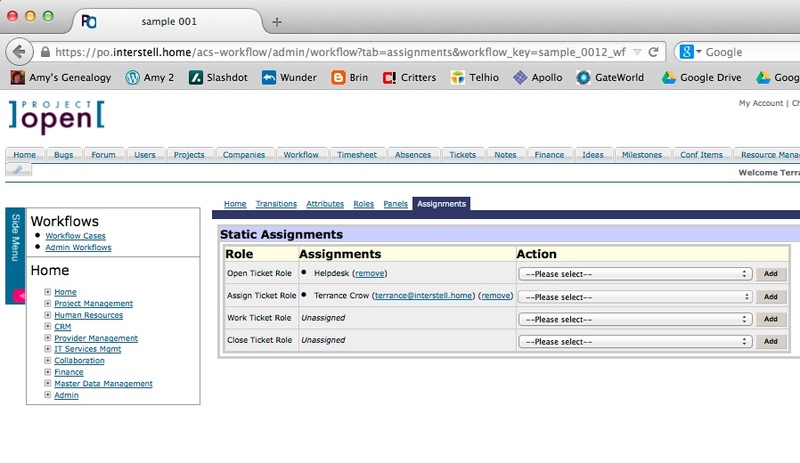 Figure 9: We can specify who can assign individuals within a Role using Assignments. 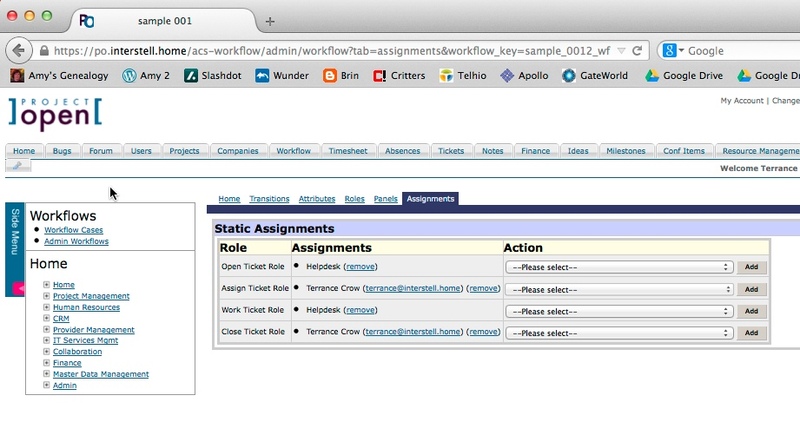 In the combo-box beside “Assign this”, select the Role to be assigned at this stage of the workflow. In this case, it’s Work Ticket Role. Click Add to see a screen like the one in Figure 10. 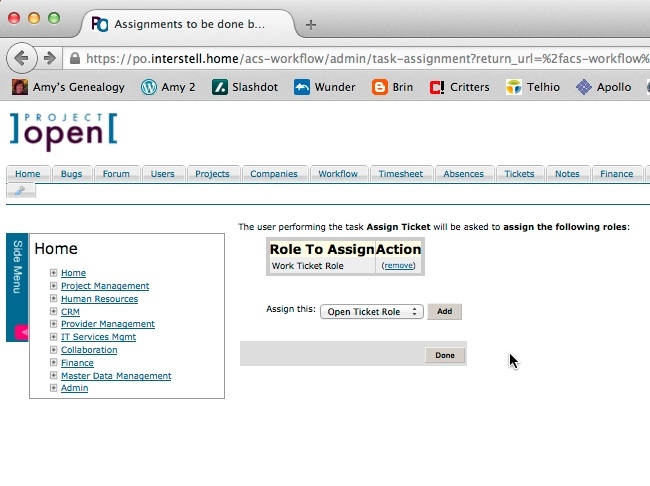 Figure 10: The individual working the ticket at the Assign Ticket step/Task will be able to select who among the assignees in the Role called Work Ticket Role will actually work the ticket. We’re done with Role and and Responsibilities! We know who within our Project Open system can open a ticket, assign the ticket, work the ticket, and close the ticket. Part 3 of the tutorial will talk about Arcs and Guards. It’ll be time to add conditional logic to our workflow!